Hello! 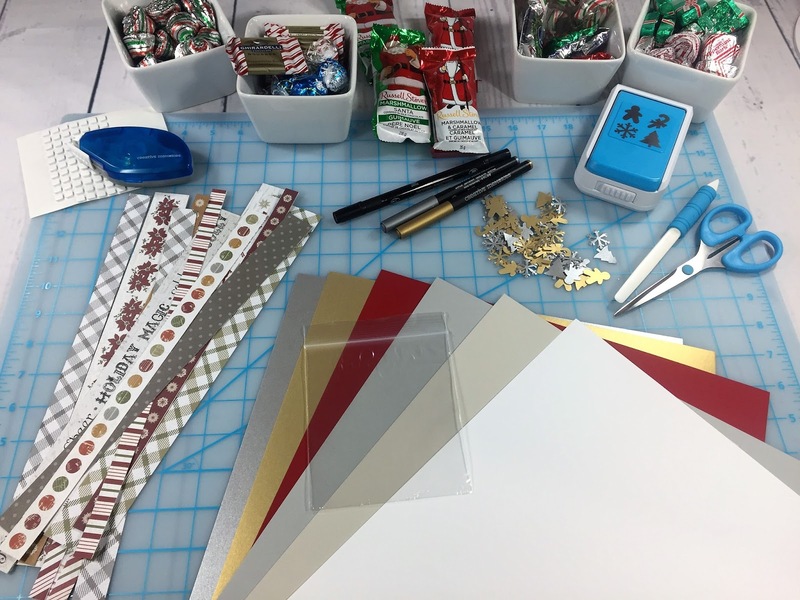 Welcome to the final stop on our Christmas Blog Hop! You probably have arrived from Fran's blog, and if you haven't visited all the stops, I'll be giving you a list at the end of this post so you can double check that you've seen all the great Christmas ideas! 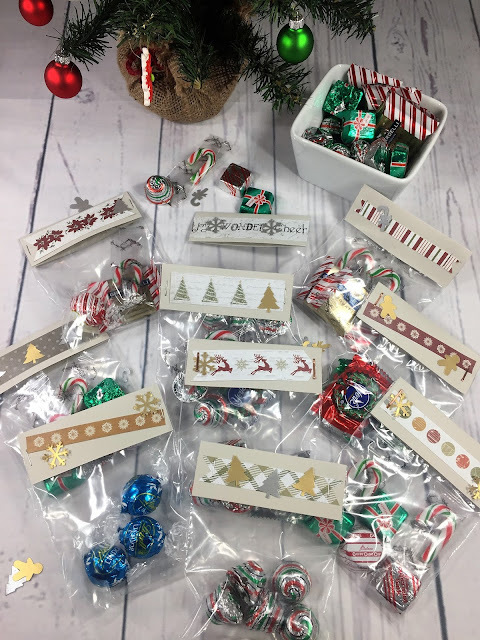 Today I'm sharing some easy Treat Bag Toppers made from the Christmas Past Paper Pack, various colors of Cardstock , the Christmas Quartet Punch and basic scrapbooking tools. 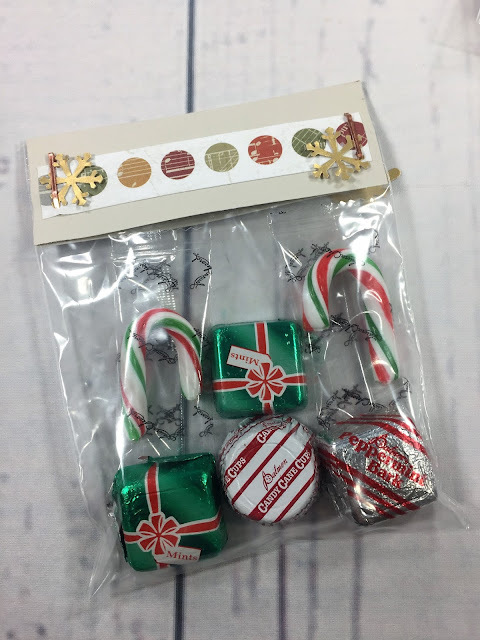 I have two boys in elementary school who both still enjoy bringing treats to their friends for holidays and special occasions, so I'm always trying to come up with new ideas for treat bags. Since I'm focusing on trying to use up all the Christmas Past products I've purchased, I came up with a plan to use the printed border paper from the Christmas Past Paper pack for this year's treat bags. 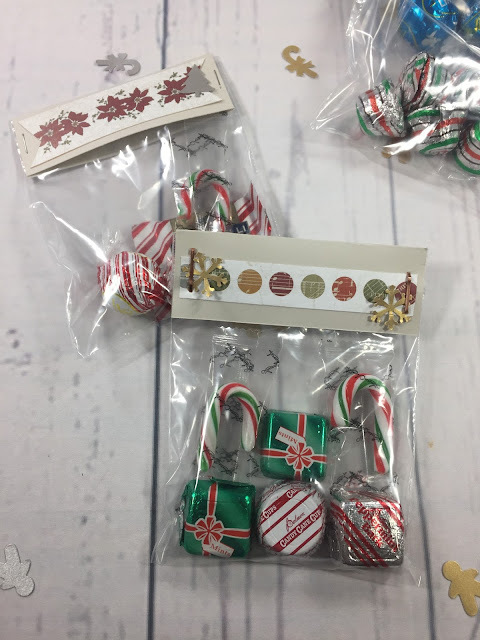 Treat Bag Toppers are so versatile - the basic idea is to fill a clear plastic or cellophane bag with treats (candy, cookies, trinkets), seal the bag closed and then add decorations to the top that fit the theme or holiday. I'll give you the measurements I used, but your final measurements will depend on the bag you are using. And although the steps are pretty self-explanatory, I did create a video to show you the basic steps. Grab a beverage and take a break while you watch! 1) Measure the width of the bag you are using. Mine were craft bags purchased at the local Dollarama store and they measure about 4.25" x 5.25". I've also used snack bags which are shorter, but wider. Sandwich bags are bigger still, but are great for cookie treats! 2) Use the measurement of your bag as the width for each piece of cardstock, and 3" for the height. 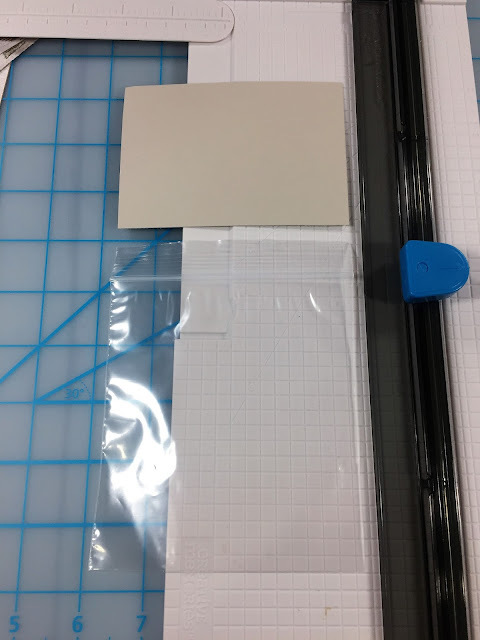 (I find 3" is enough to fold over the zip-lock on most bags, but if the closure on your bag is placed lower you might want to cut it to 4" in height.) Score in the centre using your Multi-Purpose Tool and fold over. 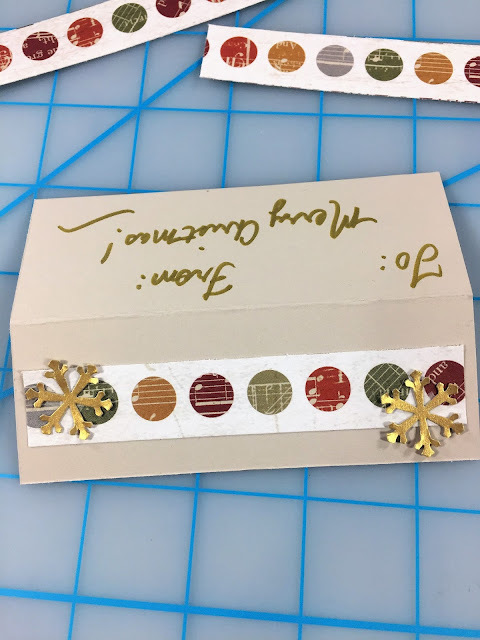 3) Use your 12" Straight Trimmer to slice the printed border paper from the Christmas Past Paper Pack into strips. Some of the decorative strips are fairly wide and can be cut in half again to give you more strips. 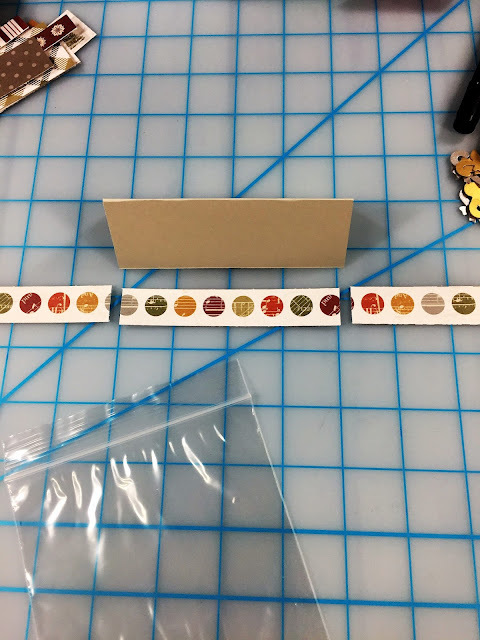 4) Trim each strip to the approximate width of your bag toppers. 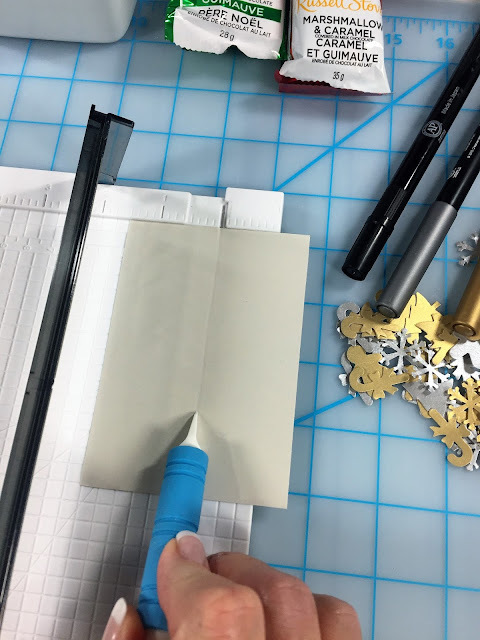 The number of pieces you'll be able to cut will depend on the width of each strip. Because my bags were about 4.25" wide, I simply cut the decorative pieces to 4", giving me three pieces from each 12" strip. Although each piece will be a little narrower than the width of the topper, you can certainly vary the placement of each strip, or trim the ends to diagonal or banners. 5) Punch a number of small shapes to use as decorations. The Christmas Quartet punch features a Candy Cane, Christmas Tree, Gingerbread Man and Snowflake. I used the Gold and Silver Shimmer Cardstock to give the shapes a little more sparkle! You could also punch these cuties out of a contrasting color of cardstock or scraps of patterned paper. 6) To assemble, simply adhere a border piece across the folded card, add a shape or two. Write or stamp your message on the back side. Fold the card over top of the filled treat bag and staple to attach. These were super quick to make - it only took a minute or so to make each bag. You could totally use up some scraps and smaller pieces to make these. Get creative with the supplies you have...each one can be unique! I think the most important thing is to give out the treat bags with lots of warm wishes for the season! Hopefully you've got some ideas from all the stops at our Blog Hop today. We LOVE sharing our ideas with you and we'd really like to hear your comments about what you would like to see in future hops. If you missed any of the other stops along the way, here are the links to all posts. We'll look forward to seeing you all at our next Blog Hop in 2017! These are just lovely! Thank you for some wonderful ideas. Love these! So cute & quick. Cute bags, Noreen! Thanks for the inspiration! Love these treat bag toppers! I think I'm going to have to create a few myself!